With the Nintendo Switch continuing to go from strength to strength, it’s no surprise that we’re seeing increased support from big third parties and indie studios alike – 2018 still to reward gamers with the likes of Dark Souls Remastered, Diablo III Eternal Collection, The Jackbox Party Pack 5 and plenty more. With this great news though also comes the expected surge in quick smartphone ports and lazy shovel-ware, a problem any successful console inevitably faces. I’ll put you out of your misery, Jumping Joe and Friends is easily the latter – a soulless, mindless experience you’re better off avoiding. Within mere moments Jumping Joe and Friends’ smartphone origins are clear, whether it’s through its menu interface or the actual gameplay itself. Everything looks and feels very bare bones. 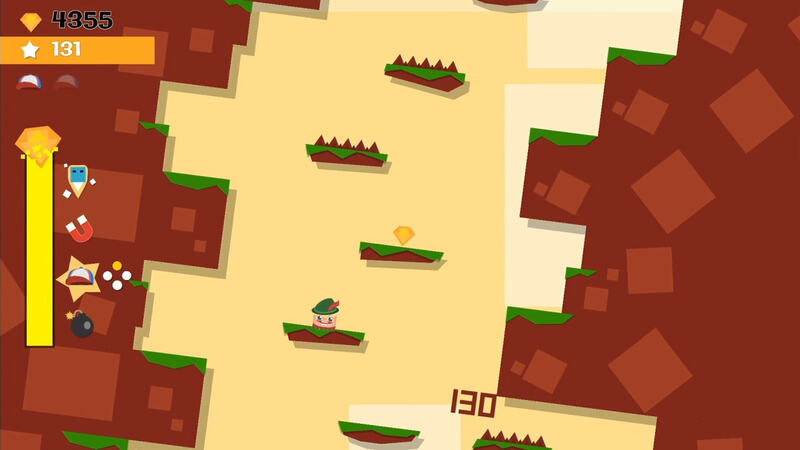 In the game, you play as a small coloured square with a baseball cap called Joe (and later his friends), as you make your way up a vertically laid obstacle course by – you guessed it – jumping. Joe can jump up and to the platform on the right or he can jump up and to the platform on the left. He must always be heading upward with a jump to a lower platform resulting in instant death. All of this is handled by simply hitting a single button (either the shoulder buttons or face buttons corresponding to the side you want to leap toward) and that’s pretty much all that’s ever asked from you in the game. The higher you manage to climb, the more problematic and frequent the obstacles become such as circular saws, spiked platforms and bats. To help you combat the rising difficulty, power-ups and extra lives can also be picked up along the way. A lot of the game comes down to quick reflexes and good timing. While your instincts may lead you to rush as fast as you can, this often leads to silly mistakes. Sure there is lava chasing you and pushing you upward, but there is time to hang around a little before choosing your action. The biggest problem I have with Jumping Joe and Friends is just how one note it is. Like many smartphone releases before it, this game focuses heavily on repeatedly playing the same mode over and over again, gradually accumulating some form of currency and upgrading or purchasing new extras. The game isn’t broken down into levels nor is there any sort of story to connect it all, this game is all about repetition. That’s all well and good when you need an easy way to kill a couple of minutes on your phone but for a console release, gamers expect more. What’s on offer here is laughable both in terms of quantity of content but also the fact none of what you’re actually doing in the game is engaging nor fun to begin with. The game very quickly loses appeal thanks to having to perform the same, mundane and basic task over and over with rewards that never justify the effort. Characters have a unique ability such as taking an extra hit or raising the chance of gems appearing each of which can also be upgraded for a fee. The cast all handle exactly the same with these abilities not doing enough to warrant unlocking, to be honest. In terms of options, Arcade mode is your standard affair while Hero raises the difficulty right from the start and Race times you at each checkpoint. They all essentially play out in the same way, offering practically no variation to what is already a far too simplistic idea. Multiplayer allows up to four players to compete in split-screen, but again the end result is largely the same as playing alone. Amusing the first couple of times but it didn’t take long for our group to grow bored. The presentation is another sore point for the game, the visuals cheap looking and the audio truly terrible with the same annoying music track on repeat from menu to gameplay. Even the characters themselves feel lazy in their design. At best you could describe the presentation as functional. All in all, Jumping Joe and Friends is your typical smartphone experience – shallow, repetitive and lacking any real hook to keep you playing. Even the multiplayer wears out its welcome in a matter of minutes. The list of excellent or just fun Switch titles is already a long one and continues to grow with every passing week. Any one of those would be a better investment than Jumping Joe and Friends.